Howls of protests by Nevada’s bipartisan congressional delegation were drowned out Thursday when the House voted overwhelmingly to pass a bill that would revive the licensing process on the Department of Energy’s application to open Yucca Mountain. WASHINGTON — Howls of protests by Nevada’s bipartisan congressional delegation were drowned out Thursday when the House voted overwhelmingly to pass a bill that would revive the licensing process on the Department of Energy’s application to open Yucca Mountain. Republicans and Democrats voted to move forward with the process to develop the Nevada site as the nation’s permanent repository for nuclear waste from power plants. The House voted 340-72 to approve the Nuclear Waste Policy Amendments Act of 2017, written by Rep. John Shimkus, R-Ill., who has sought to put the licensing process for Yucca Mountain back on track after the Obama administration cut funding in 2011. Shimkus said the stockpiling of nuclear waste at power plants throughout the country is a national problem that must be addressed. He said it was now up to the Senate to move forward and approve a plan. Nevada’s entire House delegation — Reps. Dina Titus, Jacky Rosen and Ruben Kihuen, all Las Vegas-area Democrats, and Republican Mark Amodei of Carson City — voted against the bill. Titus offered an amendment that would have required local consensus-based siting. 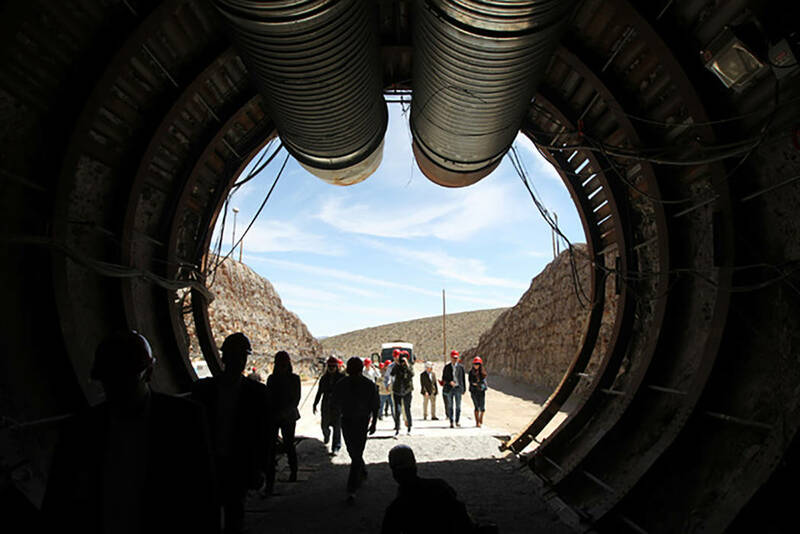 Because of overwhelming opposition to nuclear waste storage in Nevada, the amendment, if passed, would have scuttled Yucca Mountain as a repository. “I have fought the misguided and dangerous Yucca Mountain nuclear waste dump project for my entire career, and I’m not giving up,” Titus said. Despite passage in the House, the Senate remains a hurdle for the legislation. Sen. Dean Heller, R-Nev., said he will put a hold on the House bill, killing the legislation’s chances to advance in the Senate. “I will object to the motion to proceed and stop this proposal at every procedural turn,” Heller said. Sen. Catherine Cortez Masto, D-Nev., a former state attorney general, also vowed to halt the process in the Senate. Sen. Lamar Alexander, R-Tenn., plans to introduce legislation later this year that would emphasize interim storage of existing nuclear waste until permanent repositories like Yucca Mountain can be opened. Alexander has acknowledged political opposition in Nevada as an obstacle. In addition, Nevada Gov. Brian Sandoval has pledged to spend state resources to fight the development of Yucca Mountain. But nine rural Nevada counties, including Nye County, where Yucca Mountain is located, support the licensing process to determine whether the site would be safe for nuclear waste storage. “The bill gets politics out of the Yucca Mountain debate and bases the decision on science, where it belongs,” Schinhofen said. Shimkus said Yucca Mountain would provide high-paying federal jobs that would diversify the state’s economy while solving the national problem of growing stockpiles of nuclear waste that are building up at 39 states. Nevada, though, does not have a nuclear power plant and does not receive power from other nuclear facilities. “Nevada has never consented to the Yucca Mountain project. We refuse to be an unwilling host,” said Kihuen, whose congressional district includes the site. Business leaders, conservation groups and the gaming industry are concerned that transporting nuclear waste and storing it 100 miles northwest of Las Vegas could damage the state’s hospitality and entertainment industry. 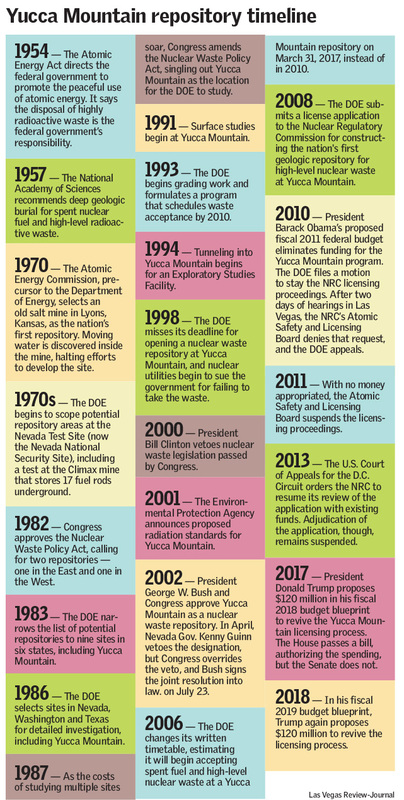 Congress in 1987 designated Yucca Mountain as the nation’s nuclear waste repository. The federal government spent $15 billion to study, research and drill a tunnel in the mountain. The DOE applied to the Nuclear Regulatory Commission for a construction permit, and hearings on that application were underway when the Obama administration cut funding and halted the proceedings in 2011. President Donald Trump sought to revive the process and included $120 million to continue licensing hearings in his fiscal 2018 budget. Although the House approved the funding, the Senate did not. Trump again proposed funding for licensing in the budget for fiscal 2019, which begins Oct. 1.